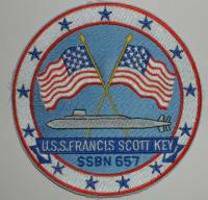 The 2018 USS Francis Scott Key reunion will be held in Branson, MO from May 9 - May 13, 2018 Anyone with suggestions for the reunion should contact Diane Singleman at diane@ssbn657.com. Plaza Hotel, 245 N. Wildwood Dr., Branson, MO 65616. The phone number for reservations is 417-336-6646. You can start making reservations now. think you might come, reserve a room now; you can cancel if you can't make it, but not might be able to get a room if you wait too long. beds) & the king suite is $99.00 & has a king size bed. You can get more details on the rooms at their website, www.bransongrandplaza.com. Be sure to say you are coming for the USS Francis Scott Key Reunion to get our special reduced room rates when you make your reservation. As always, you can come a few days earlier & stay a few days longer for the same room rates we are being given for the reunion. your own shows or sightseeing. Saturday evening will be our banquet at the host hotel. I have not yet set up the menu for this. Sunday will be check out. didn't get info on the last reunion, either you never signed up with Russ on the website, or you changed your email address & didn't tell me. Hope to see a great turnout for this reunion!!! We have formed the Francis Scott Key Reunion Association. All former Key Shipmates & spouses are welcome to join. Your membership is needed so that we can plan for further reunions & maintain the USS Francis Scott Key crew web site. Membership dues are only $20.00 per family for the initial first year; afterwards your yearly dues are only $10.00 per family. Dues receipts as well as profits from the Ship�s Store sales go into the general treasury. Donations of any amount to help maintain the association will gladly be accepted. All funds will be used to cover mailing expenses. web site fees, reunion sponsorship etc. Your support of the Reunion Association will help insure a successful reunion 08 as well as future reunions. Everyone who works on the web and provides services is a volunteer. Please make checks payable to: FS Key Reunion Association. If you have any question, just email Diane at : diane@ssbn657.com or call Al at 518-355-2119.